Not much happened. As is often the case, there was no one eligible to be Vice-President so the post is vacant for the time being. 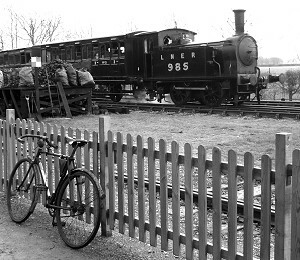 The ‘Suggested Steam Sunday’ format, where we ride over to the Mid-Suffolk Light Railway to watch steam trains while having a pint in the Kitchener Arms, worked well last year so we’ll continue with it in 2019. The Middy had a steam day on 1 January, so that was be the destination for our New Year’s Day Ride. The hints we’d dropped at the railway about opening the bar that day were successful! The dates for our monthly meetings at Rattlesden Five Bells are listed in the calendar. 2019 is a straightforward year as the nearest Thursdays to the full moon work out neatly to one in each calendar month—I think this is the first time that’s happened since we started fixing meeting date according to the phase of the moon. The V-CC Flat Section’s 2019 last-Monday-of-the-month meetings will alternate between destinations. Firstly: at the Crown in Bedfield, then riding to The Victoria in Earl Soham; secondly: at the Half Moon in Rushall. There may also be impromptu mid-month meetings at other pubs, which we stand no hope of keeping track of here. 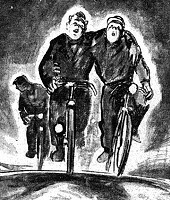 The pursuance of cycling in the leisurely fashion of days gone by. The appreciation and conservation of the countryside and its way of life. The enjoyment of local public hostelries and their ales.